What is the Parent Teacher Association (PTA)? Provide educational programs for students: Dinosaur George, SkyDome, Ben Franklin, Johnny Quinn: Olympian, Earth Dome, High Touch High Tech, High Flying Excitement, Rowdy for Reading, Morris Brothers STAAR prep, and so many more! Host staff and teacher luncheons during the school year, as well as daily Teacher Appreciation Week activities. Purchased a $45,000 canopy for the playground. Purchased $15,000 of new iPads, reflector apps, charging stations and Chrome Books for students and teachers to utilize. Purchased bookshelves and easels for class libraries and instructional materials. Host family events – Family Game Night, Book Fair, Fun Run, Multicultural Night, Watch Dogs pizza party, Donuts with Dad, back to school social and Popsicles on the Playground. Purchased over $70,000 of books for the Phillips library and for new guided reading books. Purchased equipment and supplies for the Fine Arts and P.E. Departments. Provided over $20,000 in mini grants to teachers to help purchase resources, books, electronics and classroom materials to help enrich the students daily. Host Diverse Abilities Day to increase awareness and acceptance for one another’s differences. Created an annual scholarship fund for graduating seniors that previously attended Phillips. Where does my membership fee go? From the $10 annual membership dues, $4.50 pays for local, state and national dues. The remainder supports your student and all of the activities, events and purchases from the PTA for the school. No. Joining the PTA is not the same as volunteering. We have numerous activities planned during the school year and need plenty of volunteers to make it all happen, but volunteering is not required. No. We have four to five general meetings a year and you are welcome to attend. Although we sometimes need a certain number of members to vote on an item (such as the budget), it is not required that you attend. Spend a lot of time at the school? No. There are a variety of volunteer opportunities available with the PTA. We have things that can be done at home, opportunities for working parents, activities that require a lot of hours and others that require minimal amounts of time. Simply let us know what you are interested in doing and how much time you have available to volunteer and we will help you find the right “job” for you. How do I join the Phillips PTA? Pay your annual membership dues. What does the Texas PTA do? 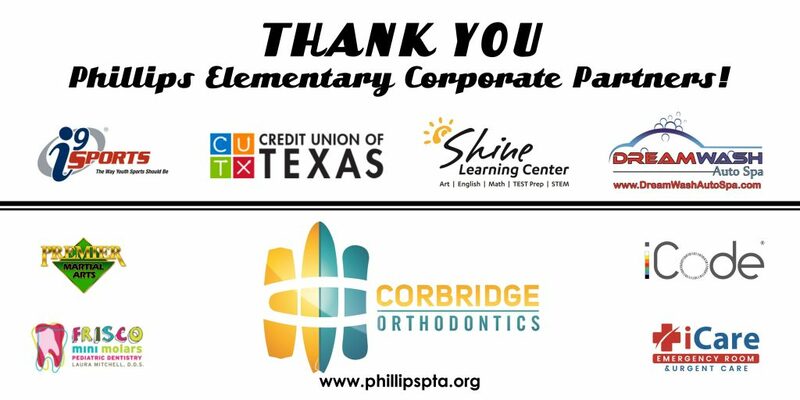 Phillips Elementary PTA – as a membership organization – is part of the larger Texas PTA association. The Texas PTA is the largest child advocacy organization in the state, with over 500,000 members. Their mission is to make every child’s potential a reality by engaging and empowering families and communities to advocate for all children. The Texas PTA also recognizes local PTA groups for their effort with awards for membership, communication, advocacy and other categories. If you have questions about PTA membership, please contact Akansha Chauhan (VP Membership) at akansha11@gmail.com.